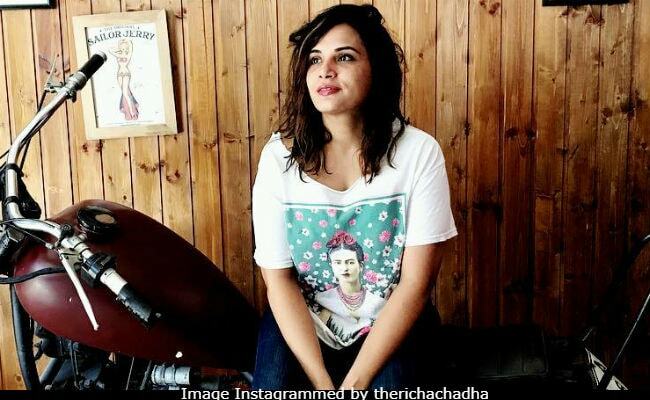 Richa Chadha, who is always engaged in some battle or the other on Twitter, resurfaced on the social media platform on Wednesday with a query. In her tweet, Richa said she's being tagged in "shame on Bollywood" tweets and appeared clueless about any possible reason behind it. In her tweet, the actress also mentioned that she recently lost her grandmother and has taken a break from social media as she's currently with her family in a no-connectivity zone. "All those who're tagging in me in "shame on Bollywood" hashtags, what for today? Have no clue. My grandmother passed away and I had no connectivity. Have to be with my family for these precious few hours I get, before I turn to the vile news," read Richa Chadha's tweet. All those who're tagging in me in "shame on bollywood" hashtags,what for today?Have no clue. My grandmother passed away and I had no connectivity.Have to be with my family for these precious few hours I get,before I turn to the vile news. Richa Chadha's tweet arrives in the wake of actress Tanushree Dutta's explosive allegation against Nana Patekar, claiming he harrassed her on the sets of 2009 film Horn 'Ok' Pleassss. In a separate interview to News18, Tanushree spoke about the impact of the #MeToo movement in the Indian film industry and said the revolution won't leave a mark in India till Bollywood fails to acknowledge what happened with her a decade ago. Meanwhile, Richa Chadha, known for calling a spade a spade, recently trended a great deal after she narrated her unpleasant encounter with a racist airport official in Georgia. Yesterday, in Tbilisi,met the gentlest cabbie... he was so sweet, he changed my experience of the city, refused a tip, smiled throughout ...We communicated only through gestures but I could feel his heart! Ahead of that, Richa Chadha made headlines as she joined other celebs in condemning Kerala MLA PC George's "prostitute" comment on nun from a Kottayam convent. Meanwhile, Richa Chadha has often contributed to the never-ending debate over sexual harassment in Bollywood. In December 2017, the she boldly stated that she could reveal names of certain people involved in casting couch if her "safety and future can be secured." Earlier this year, Richa Chadha was at the receiving end of massive backlash after she appeared to defend choreographer Saroj Khan's comment on sexual harassment in Bollywood. On the work front, Richa was recently seen in critically acclaimed Love Sonia and she is currently filming Shakeela, a biopic on the Nineties adult star.